We seem to be in something of a folk music revival: not just artists singing songs with acoustic guitars, but a significant number of younger performers taking an interest in traditional music, rather than doing original songs in the folk style. And some of these artists have been breathing new life into some very old songs. The band called Ollabelle is a stellar example. And even more established performers are looking to traditional music for their material, including Natalie Merchant and John Mellencamp. This week we have another worthwhile album by a young band in their 20s who put their own stamp on mainly traditional music, though they do also perform more contemporary material, including a smattering of original music. They call themselves the Duhks [spell], and they hail from Winnipeg, Canada, site of an annual folk festival which was founded by the father of one of the group's members. Their debut American release is also called The Duhks, and it was co-produced by that master eclectic musician, Béla Fleck. The Duhks were founded about three years ago by banjoist Leonard Podolak, son of Mitch Podolak, the founder of the Winnipeg Folk Festival. The younger Podolak was known for applying Appalachian style clawhammer banjo to traditional Celtic music, in which the banjo was rarely used. Podolak started out playing keyboards in a Guns & Roses cover band, but said he was inspired by hearing Béla Fleck and the Flecktones to take up acoustic music with a sense of adventure and eclecticism. Other Duhks include Tania Elizabeth on fiddle. She is the youngest member, at 20 when the CD was recorded. She had an early start, taking up the violin by the Suzuki method at age three, and has performed in a surprising number of musical settings from classical to country. Lead vocalist Jessica Harvey also started young, performing as actress, singer and dancer at age six. Percussionist Scott Senior plays a collection of ethnic instruments, including the large rectangular box drum the cajon used extensively in Cuban music. Senior was drawn to Latin music. According to the band's bio, there is an active Latin music scene in Winnipeg. Rounding out the group is guitarist Jordan McConnell, who not only plays guitar but also makes them. At age 23, he is already an established luthier, with some well-known guitarists as customers for his handmade instruments. There is no bass player, but they combine their instruments in a way that creates an energetic sound than can range from slow Celtic to acoustic rock. In addition to the traditional material, they also include distinctive versions of what are definitely not traditional songs, including compositions by Sting and Leonard Cohen. Among the traditional pieces are some classic Gospel and folk songs, music that was popular in the 1960s folk scene. The also perform instrumental medleys of old Celtic tunes with original pieces. It is perhaps this sense of eclecticism and musical adventure that drew the interest of Béla Fleck to produce the band's CD. 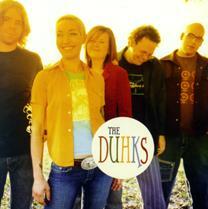 The Duhks had released an independent album only in Canada in 2002 called Your Daughters and Your Sons and initially, after the band was signed to Sugar Hill Records in the US, thought was given to re-releasing their first recording, but they decided that they have moved on enough that it was time to make an entirely new recording for their American debut. They had already been attracting attention in various folk festivals on both sides of the border. The Duhks bring a sense of energy and youthful enthusiasm in their approach. With the members also growing up on alternative rock, they bring a bit of an edge to their music, without plugging in and turning it into rock. All are outstanding players, and their musical arrangements, drawing as they do on their somewhat unconventional instrumental lineup, reflect that resourcefulness and creativity, whether they are giving a new twist to a pop song, or reviving old folk songs that were the staples of the 1960s. They do it all while exuding a great sense of confidence. The Duhks' new eponymous CD is a prime example of how traditional music and styles are finding new life among a young generation raised on alternative rock and rap. In their three years together, this Canadian band have come to bring a wonderfully eclectic approach to some old songs, and a traditional sound to some recent ones. Like most bands who mix disparate styles, the different backgrounds of the people who happened to get together, along with their musical interests has helped to shape the band's unique sound and distinctive instrumentation, combining traditional Appalachian clawhammer style banjo with Latin-influenced percussion. And the band members' enthusiasm is also infectious. Sonically, we'll give the CD an "A." Everything is recorded well, and the production by Béla Fleck and ace engineer Gary Paczosa captures the band's sound with clarity and without studio gimmicks. The dynamic range for the recording is also respectable. Since the folk music days of the 1960s, there are those who think that traditional songs must be done in the traditional way, while there are those for whom the old songs become starting points for flights of fancy. The Duhks are definitely airborne on their new CD.